The Dunagan Family will be hosting our 2017 reunion on September 24, 2017 at the Gainesville Marina Lake Pavilion. If you are a descendant of Ezekiel Dunagan or any of his children we want to see you there. Come out and enjoy the fun, food, music, and best of all the company. After moving back to my hometown 11 years ago, my cousin Brad and I decided to organize the Dunagan Family Reunion. It took a lot of work but we have found many of the descendants of ‘Ole Zeke’ and have enjoyed getting together and getting to know each other since the start of the reunions. If you are not on our mailing list and would like to be please send me your contact information and your line of descent as you know it. You will be added to our mailing list and our family tree. Ezekiel’s children are scattered far and near but we are still family. See ya at the next gathering of Ezekiel’s children. Frederick Dunagan is the oldest born son of Joseph Ellis and Lucinda Beall Dunagan and the grandson of Ezekiel and Lydia Ann Brown Dunagan. He was born on November 2, 1824 in Gainesville, Hall, Georgia. His father Joseph was 31 and his mother Lucinda was 22 at the time of his birth. Frederick was named after his maternal grandfather, Colonel Frederick Beall. We know that Frederick married Louisa Augustus Kerbow on October 22, 1846, Jackson County Georgia, when he was 22 years old and she was 18. They had four children in nineteen years. Harriet H. Dunagan West Andrewartha was born July 13, 1847. Their second child, Columbia Clementine Dunagan Tate was born November 22, 1848. Joseph Milton Dunagan, their first son and third child was born in White County Georgia in October of 1850. Some years later in 1866 their son William Dunagan was born, also in White County Georgia. We find Frederick and his family in Hall County, Georgia in the 1850, then in White county in the 1860 census. His occupation was listed as farmer. In the 1870 White County, Georgia census we find Louisa with three of her children. Frederick and Columbus Clementine were not listed in the household. We know that Frederick had already left for Idaho where is listed in the 1870 census as a farmer whose farm is valued at one thousand dollars with his personal belongings valued at three hundred dollars. He has one farm hand living on the farm with him. His farm was located in the Idaho Territory, Alturas, Overland Road. I believe that Frederick went ahead of the family to prepare a home for them. 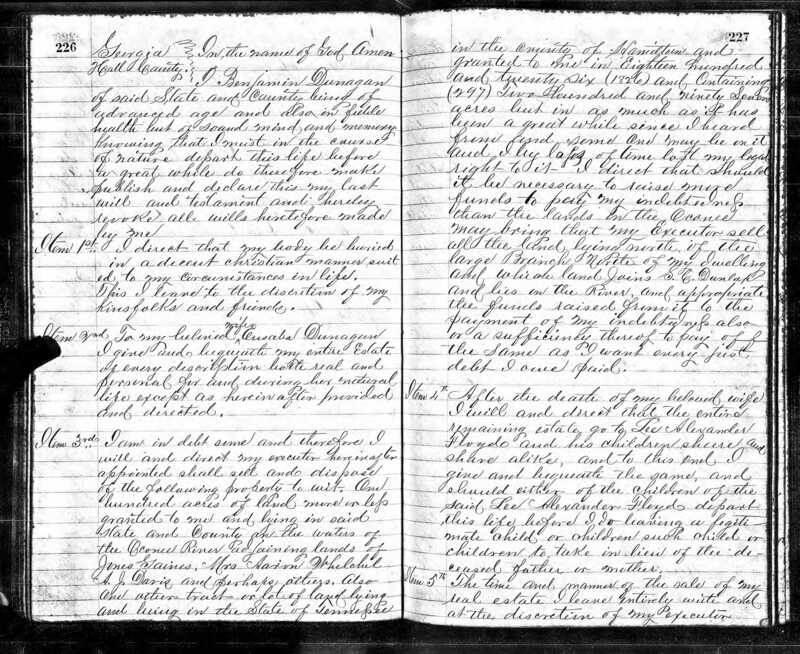 Idaho History Volume 3 states that his daughter Harriet came to Idaho in 1874. I will need to do more research to see when the others arrive in Idaho. By 1880 we discover that Frederick has not only changed professions but has also divorced. He has made his home in Hornet and Little Salmon Valley, Washington, Idaho. His profession is now listed a singing teacher. “… Frederick Dunagan, a musician of ability, who also taught music and who became a prospector and miner, going to California as a gold seeker in the early ’50s. Later he came to Idaho, living in old Alturas county for many years. He afterward removed to Baker, where he passed away in 1907. I know that Louisa, his wife, is buried in Boise, Ada, Idaho in Morris Hill Cemetery. Fred died in Baker, Idaho in 1907, however, I have been unable to find the location of Frederick’s burial to date. I would love hearing from any of Fred and Louisa’s descendants and learning more about my third great uncle. 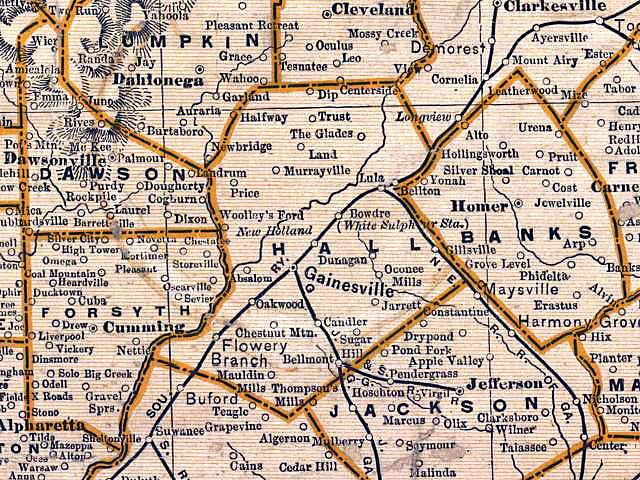 This is an 1899 map showing Dunagan, Hall County, Georgia. It is here that Joseph and Joshua Dunagan brought the first group of white settlers. Shortly after their arrival, Ezekiel and Isaiah came with the second group of settlers. Ezekiel stayed and raised his family in this same area. At the time of his death in 1836, he owned three thousand acres. Ezekiel’s descendants remained on his land and built a community that was known as Dunagan, Georgia. The Dunagan community can be seen on this map located under the “A” in the word “HALL”. 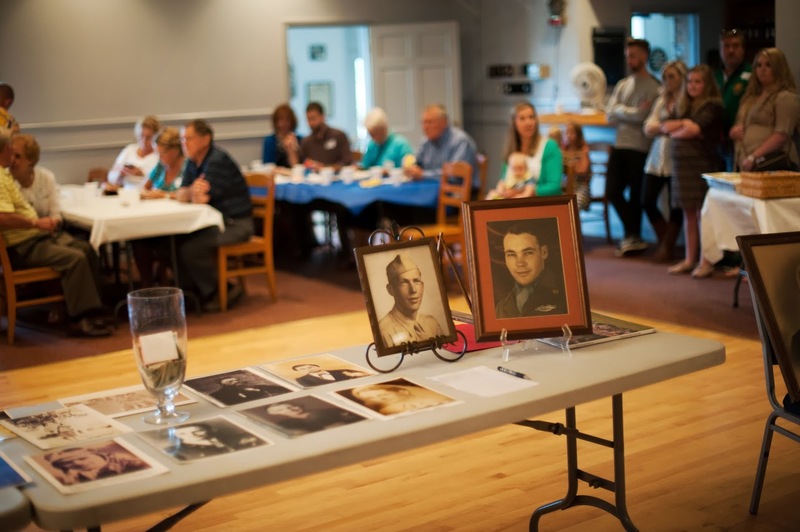 This was our fourth year to host the annual Dunagan Reunion for the gathering of Ezekiel and Lydia Ann Brown Dunagan’s descendants. I found that this year I was really looking forward to seeing the familiar faces of my new-found cousins. We have a real sense of family that has developed over these four years. My cousin Brad Dunagan overheard two of our little ones discussing, with astonishment, how many people they were related to. I think it is wonderful that they can come out and know that they belong to a family much bigger than the one they live with. We began our Saturday at Dunagan’s Chapel located in east Hall County, Georgia. This is the area that Ezekiel and his family lived. It was known as Dunagan, Georgia back then. At the time of his death in 1836, Ezekiel owned over three thousand acres there. We still have Dunagan’s living on parts of his land today. This is also where Ezekiel and Lydia’s graves are located. We visited the gravesite and returned to the church to discuss and share information on our family and its history. On Sunday we gathered at the Paul E Bolding Post of the American Legion in Gainesville, Hall, Georgia. This is year we honored our family members who labored to develop, defend, and serve this great nation of ours. We have had Dunagan’s and allied family members serve our nation in every conflict since the Revolutionary War to present date. We have also had judges, mayors, congressmen, senators, and governors in our proud lineage. Reverand Roger L. Dunagan of Lumpkin County, Georgia offered a prayer and blessing on the food, after which we shared a delicious southern pulled pork barbecue with banana pudding for dessert. In addition to good food, and great company, we had music provided by Brad and Mike Dunagan’s band, Longstreet Station. We had family members traveling from many states to attend this year. Thanks to each of you, near and far, who attended this year’s Dunagan Family Reunion. We are looking forward seeing you all and more next year. 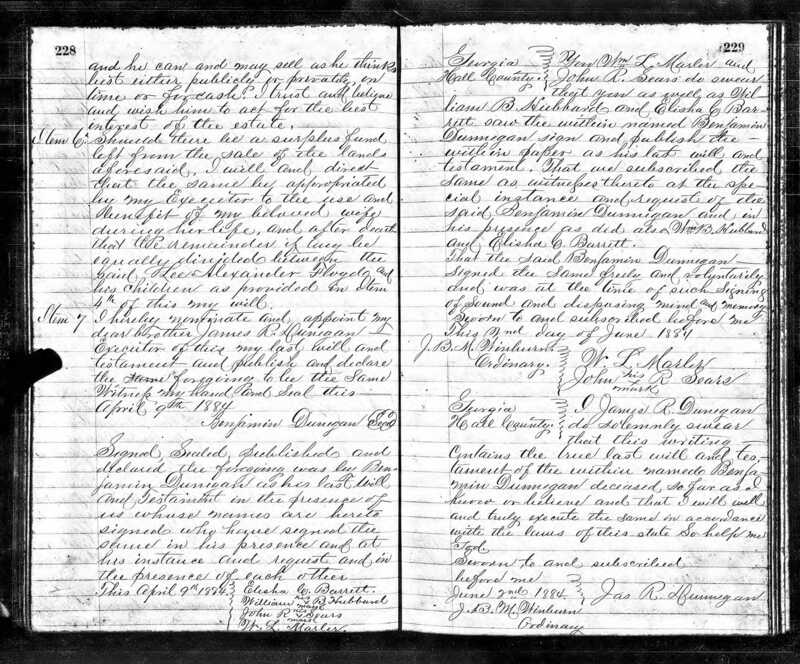 During the 1830’s my ancestor’s continued to be actively engaged in the building and establishing of Hall County Georgia. It had been sixty years since Joshua Dunagan and his brother Joseph Dunagan (my fifth great grandfather) had brought the first group of settlers into what is now known as Hall County Georgia. The site of their settlement was located near present day Gillsville and was known as Stonethrow. It was a remote frontier located in hostile Indian Territory and even though it has grown and prospered in those sixty years it still remained a remote area that required much from those who lived here during the 1830’s. The occupation and livelihood of most of its population was chiefly agricultural. Life was hard and laborious work was required to survive and prosper. Social life was largely limited to church and church related social events. Occasional special events would find themselves on the calendar from time to time. One such special event of the year was the celebration and observance of Independence Day. Hall County citizens gathered to enjoy good food, good company, and hear political speeches orated by the citizens and special guest. The first Fourth of July celebration recorded in Hall County was in the year 1833. The celebration began at the square at 11 o’clock with a procession headed by Major General Bates, his staff, and the officers of the day. They were escorted by the Gainesville Hussars to the Baptist Church where the many citizens were gathered. Reverend Parks addressed the group, followed by a reading of the Declaration of Independence by David C. Neal, Esq., after which an oration was given by Mr. James W. Jones. The celebration continued into the afternoon with much of the activity held at the Limestone Springs. Limestone Springs was located at what we know today as the intersection of Green Street Circle and Thompson Bridge Road (named so because of the original covered bridges built by Andrew Thompson’s sons). The dinner, which was prepared by Mr. Joseph Frederick, was enjoyed by the Gentlemen at the Springs. Presiding over the program was a Mr. Rueben Thornton and his assistant Madison R. Mitchel. Formal toasts were offered followed by volunteer toasts from the gathered guest. There were many “Volunteer Toasts” given that day but for purpose of interest, I am only quoting those pertaining to the Dunagan family. “By Joseph Dunnagan Esq. – ‘The protective system; originally advocated by some Southern men, and now strange to tell, the same men are the foremost to advocate unconstitutional measures to get rid of.’ “. “By Mr. B. Dunnagan – ‘Detested be every…pendant such as the palmetto flag, with all that rally round them, but let all true hearted Americans rally round our star spangle banner emblem of our Union, and long may it wave o’er the land of the free and home of the brave.’ “. The Independence Day festivities were the spotlight of the political season, the following account is of the 1840 celebration in Hall County Georgia. The celebration began that morning with an assemblage of the citizens at the Court House and a walk to the Academy Spring, where they heard a reading of the Declaration of Independence by Joseph Dunagan and a speech by T. C. Hackett. Keeping with tradition, they partook of an appetizing meal prepared by Wiley Sledge. The preset toasts were once again delivered followed by the volunteer toasts. As said before, many toasts were given that day, but I will quote those only from the Dunagan family. The Dunagan’s of Hall County Georgia have been actively involved in the community and its government since their arrival here in the 1790’s. That tradition continues even today. Callier Daniel ‘Danny’ Dunagan, the third great grandson of the aforementioned Joseph Dunagan resides today as mayor of Gainesville. Sandra Dunagan Deal, wife of Governor Nathan Deal and the third great granddaughter of the aforementioned Joseph, is the honored First Lady of Georgia. May we always remember the great men from whom we came and do honor to them as they did us. I pay tribute to my forefathers and those whom have fought, served, and labored to build and preserve this great nation of ours. Joseph Dunagan – He came into Georgia about 1790 and built Dunagan or Donnegan Station in old Franklin County Georgia. A leader among the settlers, he and his brother Joshua lead the settlers into Indian territory where they established the first settlement known as Stonethrow. Ezekiel Dunagan – A pioneer and founding settler of Hall County, Georgia and a veteran of the War of 1812. 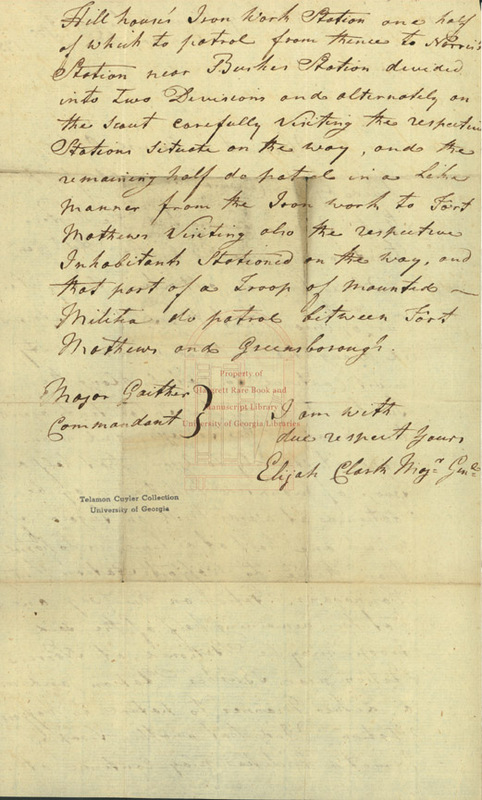 Ezekiel served as a spy during the war and his name can be found on the roster hanging in the Georgia State Archives. Joseph Ellis Dunagan – “Old Constitution” a Georgia State Senator representing Hall County for 23 years and a valiant and staunch defender of the Constitutions of the United States and Georgia. John Franklin Dunagan – A Civil War Veteran who was also taken prisoner during the war. Joseph Alexander Dunagan – Born in 1862 while his father was fighting in the Civil War, he was too old to fight in WWI. He came from patriotic men and he raised patriot men. Lester Commie Dunagan Jr. – My father, who fought bravely in WWII and continued his service to his country for the remainder of his life. Serving as First Sergeant in the Georgia National Guard till retirement, serving as Commander of the Paul E Bolding Post of the American Legion and serving as State Commander of the Georgia American Legion, he was the most patriotic man I have ever known. Matthew L. Scruggs- Continuing the tradition is my son who served in the United States Air Force and the Air National Guard with a tour in Iraq. His service left him disabled and hero always in my book. This is just one line of the great defenders of freedom from which I descend. I am honored to be able to trace my roots back to the beginning of our Great Nation and say those were my ancestors. It is to them and men like them that we owe our freedom! 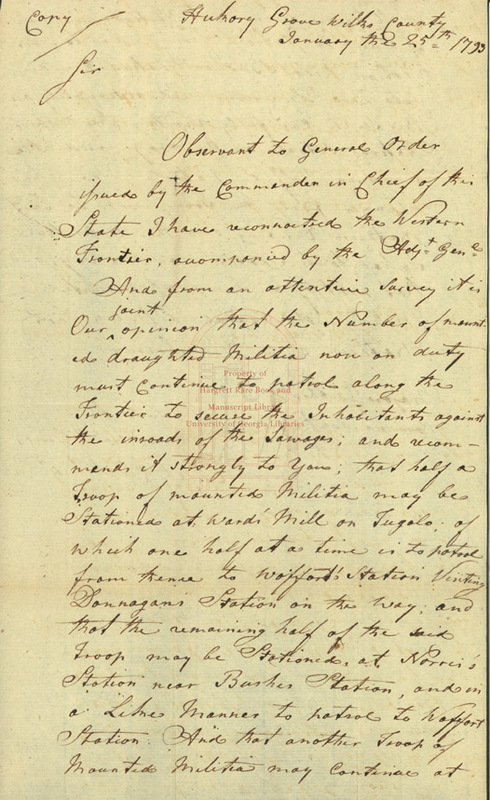 As was stated in “Following Joseph”, we know that Joseph Dunagan (1740-1808) came into Georgia in or around 1790 and settled in Georgia’s original Franklin County. His land was near the Curahee Mountain on the upper North Fork of the Broad River. 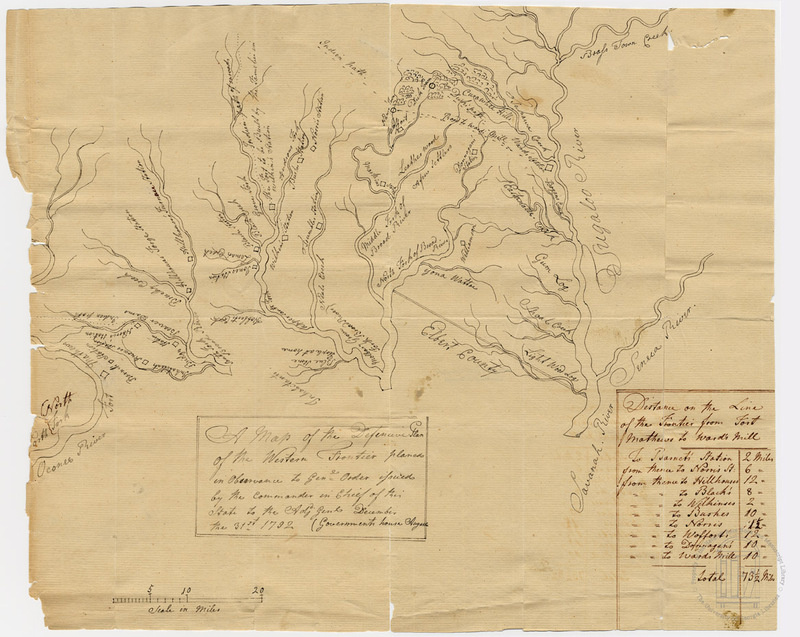 Posted is a map showing the location of Joseph Dunagan’s land. It is referred to as Donnegan’s Station on the map. Also posted is a letter from the settler’s to the Governor, notice that Joseph’s signature shows that he spelled his name as Dunagin. 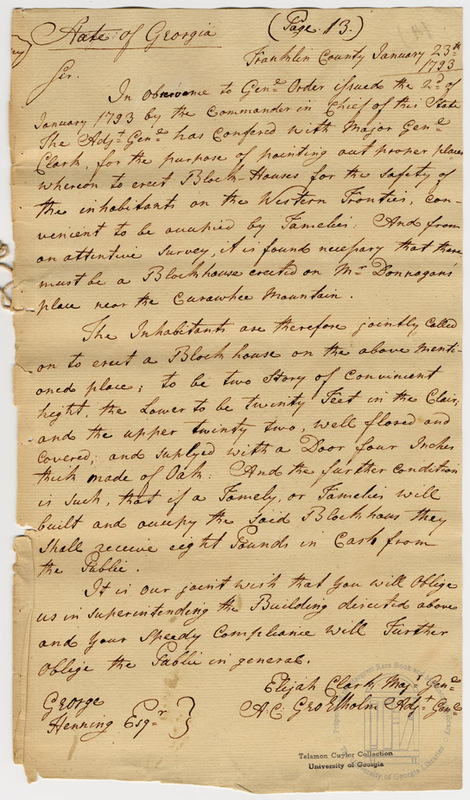 You will also see documents referring to the building of a blockade on Donnagan’s Plantation and general orders given to build the blockade. Also note on the map that Donnegan’s Station was located ten miles from Fort Mathews and 2 miles from Wofford’s Settlement.